After a wet spring, summer has been exceptionally hot, with temperatures in the mid-90s for a month. Contrary to what our president says, climate change is real and is affecting us now. Like most of the Northwest USA, our skies are grey with smoke from forest fires, making working outdoors challenging. The rising sun is bright red, while the color of the rising moon changes from day to day. One evening it was a brilliant golden-orange—we thought Manjusri, the Buddha of Wisdom, might burst out of it. Another evening it was a rather eerie, dull maroon color. But flowers keep growing. I admire the spunky, beautiful ones that grow out of the gravel. They don’t let anything discourage them from blossoming and their enthusiasm cheers all of us on to live in the same way. On August 15, Approaching the Buddhist Path, the first volume in a series titled The Library of Wisdom and Compassion co-authored by His Holiness and Ven. Chodron, was released by Wisdom Publications. This series will be His Holiness’ major English-language work describing the path to awakening from beginning to end. 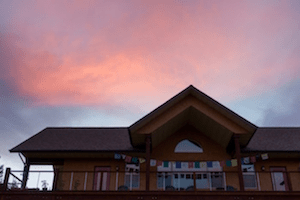 Designed especially for people newly coming to Tibetan Buddhism, the series begins with discussion of living a meaningful life, the nature of mind, and working with emotions. These, and many other topics, are in Approaching the Buddhist Path, which also contains a chapter in which His Holiness speaks personally about his Dharma practice and how it has helped him deal with the challenges in his life. You can purchase the book from Wisdom Publications or Amazon. On July 7, the Wall Street Journal published an op-ed article that was extracted from Approaching the Buddhist Path. You can read the thought-provoking article here and view Ven. Chodron’s comments on it here. Garrison Institute also posted on their blog an extract from the book that differentiates panicky fear and wisdom fear. Ven. Chodron shares on the story behind the book here and reads an excerpt from it here. 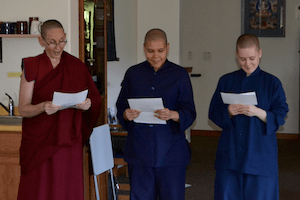 This was the Abbey’s 13th annual Exploring Monastic Life (EML), a 2.5 week program designed for monastics and those considering monastic ordination. Including the junior members of the Abbey community and guests from many different countries and cultures, 15 people participated in the program this year. In the daily teaching sessions, Ven. Chodron focused on explaining the passages in the ordination rite where the preceptor and instructor give advice and instruction to the ordination candidate. These passages contain important instructions that are valuable for all monastics, so the Abbey’s senior monastics also attended the teachings. Watch the teachings here. The discussion sessions were only for course participants and focused on topics worthy of contemplation, such as our spiritual yearning, attachment to relatives and friends, trust, authority issues, romantic relationships, and so forth. One participant commented that she had never discussed such topics, especially in personal terms, in all the other Dharma centers she had visited. This is a special feature of training at the Abbey, where we emphasize self-acceptance and transparency. We are all in samsara together, so we must help each other. EML concluded as it does every year with skits in which we make fun of ourselves. This brought great laughter and enabled us not to take ourselves so seriously. (Although we certainly take the Dharma seriously!) See photos here and here. 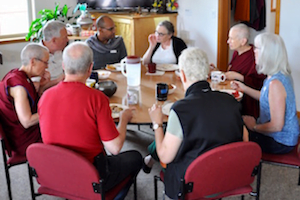 A group of old and new students joined Abbey residents and EMLers for the August Sharing the Dharma Day. After a guided meditation, Ven. Chodron gave a talk on Chapter Two of An Open-Hearted Life, “What Is Compassion and Why Do We Need It?” Watch the talk here. After lunch, an interesting discussion ensued about what compassion means to us and how we live it in our lives. These very practical teachings and discussions are great for integrating the Buddha’s teachings into our daily lives and improving our relationships with others. 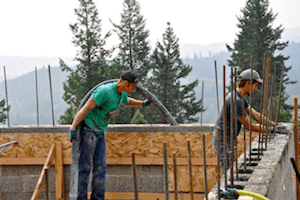 Construction on Prajna House continues. Each evening, many of us stroll on the path to the building site to see the day’s progress. View photos here. The faswall walls are up now and as soon as the inspector comes, concrete will be poured inside the blocks. Watch the video on completing the faswall walls and learn more about why Sravasti Abbey uses faswall. The trusses for the roof have arrived and they’ll be put up next. It’s exciting to see this cozy residence grow; the plan is to have it ready before the winter. We are very grateful to all of you who have contributed to providing a home with running water for Ven. Chodron. Ven. Tarpa and Ven. 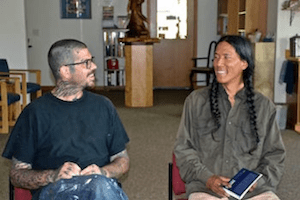 Losang visited the Buddhist group at Airway Heights Correctional Facility. This was Ven. Losang’s first visit as an official volunteer. Ven. Tarpa completed the course for volunteers a few years ago. Another volunteer, Sue, joined them and together they met with the Buddhist group for two sessions. Meanwhile, Ven. Jigme handles the bulk of the correspondence with inmates who write the Abbey with questions on Buddhism, while other nuns also help out. We greatly appreciate Cheri, the volunteer who kindly responds to inmates’ requests for Dharma books. 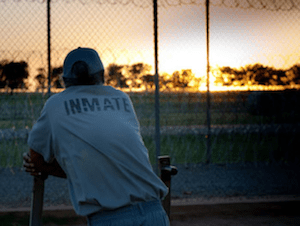 The number of prisoners contacting us continues to increase and we are touched by the sincerity of their letters. By its existence, Sravasti Abbey is charting a new course for nuns in the West. We will continue to do this by hosting a rare and precious program on monastic discipline (Vinaya) from January 22 – February 8, 2018. 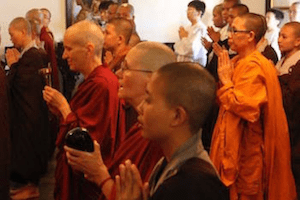 This 16-day course will be taught by Venerable Bhikshuni Wu Yin, a Taiwanese Vinaya Master ordained for over 50 years, and is offered free of charge to nuns. We welcome donations to help cover operational costs for the Abbey, including meals for the sangha and airfare for the teacher, the translator, and an attendant. Donations may also be used to provide scholarships for nuns living overseas. Click here to donate and make sure to select “General Fund” (under the heading “How should we use your gift?”) and write “Vinaya Course” in the additional comments box so we can utilize the funds for that purpose. Thank you for your generosity. For those of you who love to cook, we seek volunteers to prepare meals for the sangha during the course. It’s a wonderful opportunity to be with the nuns and to accumulate merit. Please contact Ven. Nyima. If you are interested in joining the course, more information is available here. Welcome! Work continues in our forest: thinning trees and taking out dead debris in order to have a healthy forest and remove fire hazard. 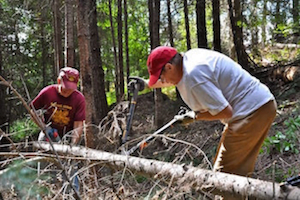 The August work day welcomed many eager volunteers and we accomplished a lot in the forest with four people on chainsaws and many more with loppers and hand saws. We had a great time! Others worked in the veggie garden and our small orchard and many volunteers happily made applesauce and preserved peaches, which are welcome treats in winter. They also prepared a yummy and nutritious lunch for the forest team. The day concluded with rejoicing and the dedication of merit. Photos are here. For going on five years, Sarah and Doug (who also coordinate Offering Service Saturdays) have invited the Abbey community to relax for a day each year at their family’s summer cabin by Idaho’s Hayden Lake. Thanks to their generosity, eight monastics and two anagarikas enjoyed a beautiful summer’s day reading and writing in the cozy cabin, and swimming and kayaking in the gorgeous lake. Sarah and Doug cooked a delicious Italian meal and we had an engaging discussion over lunch about the future of bhikshuni ordination. Pet poodle Cora’s presence was also much welcomed. 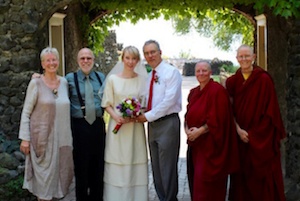 We are grateful to Sarah and Doug for caring for the sangha community in so many ways! Friends of the Abbey, Dan and Julia, were married by Buddhist chaplain Bill on August 3 at Arbor Crest in Spokane, a historic estate on a high bluff with a beautiful scenic view. Also a long-time friend of the Abbey, Bill performed a song of hope he wrote for his dying father, which the couple thought was an apt teaching on impermanence. Ven. Tarpa and Ven. Tsultrim represented the Abbey community to rejoice in the occasion and offered the newlyweds an Amitabha Buddha statue. It’s wonderful when Abbey friends support each other in major milestones in life. We wish Dan and Julia harmony in their relationship and to keep growing in wisdom and compassion together! 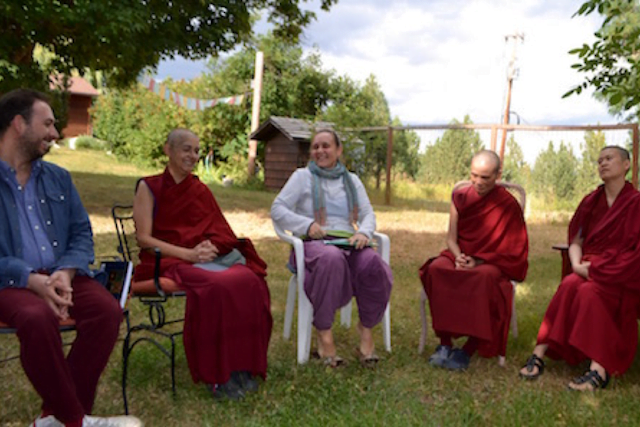 While in Portland last month to learn classical Tibetan at Maitripa College, Ven. 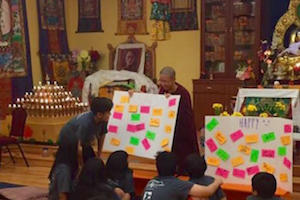 Damcho connected with the Northwest Tibetan Cultural Association to find a Tibetan conversation partner and was invited to help out with their annual one-week summer camp for Tibetan children. Over two workshop sessions, Ven. Damcho shared on how the mind works and the life of the Buddha, and led children from ages five to fifteen in meditation and discussions about what makes us happy. She was impressed by the efforts of all the volunteers to design an enriching camp for Tibetan children in America to connect with their language and culture, with activities ranging from Tibetan song and dance to handicrafts, and a field trip to Maitripa College as well. Ven. Damcho found it a privilege to share the Dharma with a younger generation of Tibetans, who will hopefully cherish their rich cultural heritage and connection to the Three Jewels. Wisdom Academy is now offering Buddhism: One Teacher, Many Traditions Part II. It’s an online course, laid out in 10-week segments, using video teachings by Ven. Chodron. Part II can be taken as a stand-alone course or as a sequel to Part I. In it, Ven. 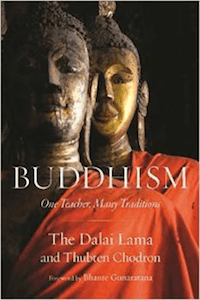 Chodron reads from and explains the book with the same title that she co-authored with HH the Dalai Lama. Part II focuses on the four establishments of mindfulness, emptiness, and the union of serenity and insight. Enrollment is open now for Ven. Chodron’s course, “Buddhism: One Teacher, Many Traditions Part II.” See details and sign up on the course site. Ven. 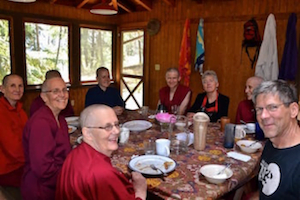 Chodron and other Abbey monastics shared their thoughts about what happened at Charlottesville over many Bodhisattva’s Breakfast Corner talks. You can listen to the talks here. Ven. 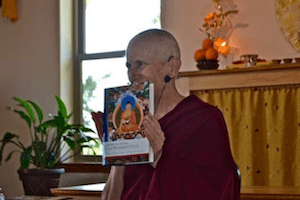 Chodron gave a series of Bodhisattva’s Breakfast Corner talks on the relationship between spiritual mentors and their students, in light of the confusion that people feel over recent events at a prominent Buddhist organization. Listen to the talks here, here, here, and here. Abbey monastics write articles for the “Ask a Buddhist” column hosted by Spokane Faith and Values. Read about assisted suicide and euthanasia and suicide and the effect on those left behind. Thubtenchodron.org has a Vietnamese section and recently posted on it is the Vietnamese translation of Working with Anger, Xử lý Nóng Giận. Please enjoy! In this day of alternative facts and truthful hyperbole, Ken shared his thoughts on the truth here. Read Rebecca’s poem about transforming attachment into love and deeper refuge in the Three Jewels. We continue to appreciate the joyous effort of our summer guests—Ryan from Cleveland is here for a few months, and cousins Toji who is Native American and Japanese, and Roger who originates from Brazil bring diversity to our mix.